Less rotation last week…more outright selling. Was this the typical, pre-holiday trade, or the start of something larger and longer? I’ve read a lot of commentary on both sides of this debate. It seems like there is a lot of uncertainty and limited conviction either way (lots of statements like “the markets could rally if we see a 5% correction”, or “if these 15 things happen, then we “maybe” see…, etc.). This week kicks off with a shortened session on Monday, then traders take the day off on Tuesday for in honor of Independence day. 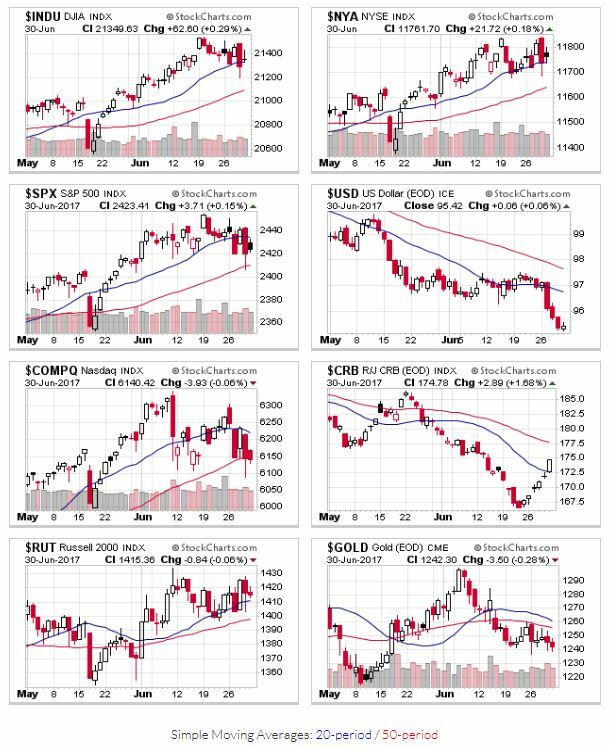 The Nasdaq led markets lower last week, as technology names sold off, and closed below both its 20 and 50 day moving averages. The S&P500 starts the week below its 20 day as well, while the Russell, DJIA, and NYSE are just barely above that level. For now, the uptrend remains in place. Through the price/volume lens, price action continues to support an uptrend (all but the Nasdaq are above the 50 day), but volume action shows a lot of high-volume selling. The distribution day count has the Nasdaq at 6, Dow Jones Industrials at 7, NYSE at 7, and the S&P500 at 8). The increase in distribution days changes this signal to mixed. No change in midterm OEW signal; the uptrend stays in place, but may have topped.